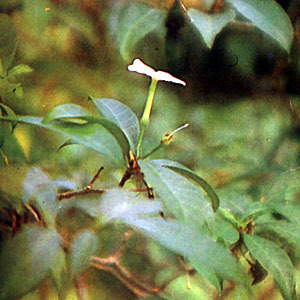 Pandakaki-puti – Scientific name: Tabernaemontana pandacaqui Poir. Erect, branched and smooth shrub, 1-3 meters high. Leaves are short-stalked, elliptic-lanceolate to oblong-elliptic, 5-12 cms, narrowed at both ends. Inflorescence are axillary and terminal; the flowers are few. Calyx is green, ovoid, and short. Corolla is white, slender-tubed, 1.7 cm long; limb is 2 to 2.5 cm in diameter, composed of five, spreading, falcate, lanceolate lobes. Follicles are red, oblong, 2-4 cm long, and longitudinally ridged. Common in thickets at low altitudes. Eczema: Boil 3 cups of chopped leaves in one gallon of water for 10 minutes; add 2 gallons of hot water.Also, fry the fresh leaves in oil and apply to itchy skins lesions for symptomatic relief. Hot Foot Baths: A local immersion bath covering the feet, ankles and legs used for a variety of conditions: To relieve head, chest and pelvic congestion; to stop nosebleeds; to relieve spasms and pains of feet and legs; to induce sweating; to relieve menstrual cramps and headaches. Leaves applied as cataplasm on abdomen to hasten childbirth. Decoction of root and bark used for a varitety of stomach and intestinal ailments. The white sap of the stem is applied to thorn injuries and to hasten the surfacing of the thorn fragment. This entry was posted in List of Medicinal Plants in the Philippines and tagged pandakaki puti on March 24, 2009 by Pinoy Herbs.